Taiyaki (鯛焼き) is a traditional Japanese fish-shape cake filled with red bean paste. The Taiyaki shops use big cast iron pans like these to make many taiyaki at the same time. For home use, we use a mini taiyaki maker like this below. And today I’m giving away a Taiyaki Makers to three (3) readers around the world! Bonus Entry 5: Go to my Facebook Page and “Share” one of my posts on your timeline. (Copy and paste the hyperlink as a separate comment if you do this.) You can do this Bonus Entry 5 EVERY DAY to increase your chance to win! Three (3) winners will be selected via Random.org and announced on Monday, October 13, 2014. This giveaway closes on Sunday, October 12, 2014 at 12 p.m. PST and is open to participants worldwide (everyone!). The winners will be contacted via email, so please include a valid email address in the email address entry box. Full Disclosure: This giveaway is sponsored by yours truly. Thank you for participating this giveaway! The three winners are…. KY (#702), Mari (#1190), and Matt (#527). I’ll contact you via email shortly. Congratulations! red bean paste, it’s classic! I’d fill with some sweets and also some tsubushian filling! I’d try all kinds of fillings!!! I would put red bean paste in mine! Love it! I Subscribe to Namiko Chen on YouTube. I Follow Just One Cookbook on Google+. I love this cute fishy maker. Fishy Fishy! I Follow Just One Cookbook on Pinterest. I love RED BEAN Fish!!!!!! My favorite! I would like to put custard inside my taiyaki! What a beautiful design. I sure would like to try this! I am subscribed to you on Youtube. I also liked the Just One Cookbook on Facebook. A nice jam or compote! most definitely red bean paste! I already liked just one cookbook in facebook … and still love it! Already following you on Pinterest. Love your blog. MMM, azuki. Go. Win, taiyaki mold!! Bonus entry 2: Subscribed on Youtube! Red bean paste is my favorite filling! I love the red bean paste filling! I follow JustOneCookbook on Pintrest! I LIKE JOC on Facebook! My favorite filling is red bean paste but the custard is also pretty good. If I made them at home is probably stick to red bean paste. White bean paste is also tasty. I found that once in Hirosaki. What a fund giveaway! I would probably put some form of red bean paste in the taiyaki! Love your blog, my family really enjoys Japanese Food and I love to make it for them. I would definitely put custard (or purin…) in my taiyaki! I have subscribed to your YouTube channel! I follow JOC on Pinterest! cream cheese and strawberry jam! they sell this in the food court of takashimaya in Singapore and I miss it a lot! I would like to see a cheese filling. The fillings could be endless. I love blueberry or apple compote would be lovely. I would love to put red bean or custard in it. So amazing! I love taiyaki. I am originally from San Francisco and there was a wonderful little taiyaki stand in the Japanese Center and we loved to eat taiyaki fresh cooked. I would love to win the taiyaki maker. I am a traditionalist, so I would opt to make mine with the red bean paste, however the nutella filling sounds very tempting. I am a follower on Google+. I have subscribed to You on YouTube. Coconut Spread would be nice. Custard is the best. In front of the Nakano train station in Tokyo: delicious! I really love anko so I think I would go traditional first and use it. Then Nutella, of course. Red bean paste for me too! These look so tempting on a plate. I would love to win this for my son and daughter in law who cook such marvelous meals for me and their other guests. Thank you for the opportunity. “Liked” Just One Cookbook on FB! I follow Just One Cookbook on Pinterest! I ‘liked’ Just One Cookbook quite some time ago….. These are so cool! I’d try red bean paste and then nutella. Thank you so much for your great emails. I would prefer red bean paste, I find it delicious. My favorite is the traditional red bean paste, but fruit preserves are a close second. 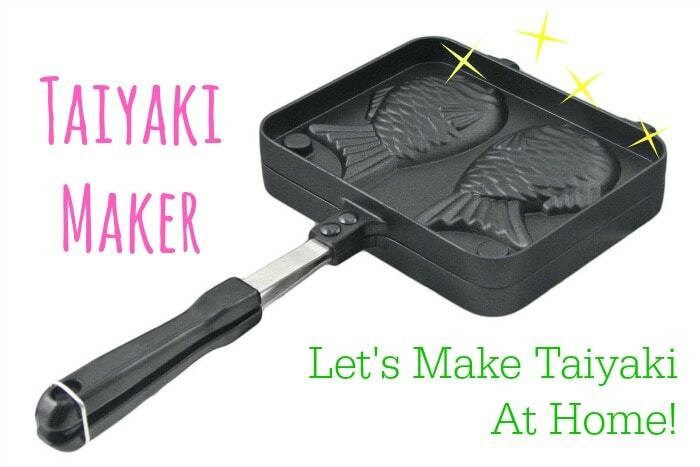 Oh I’ve always wanted a Taiyaki pan!! Thank you for running this giveaway!! 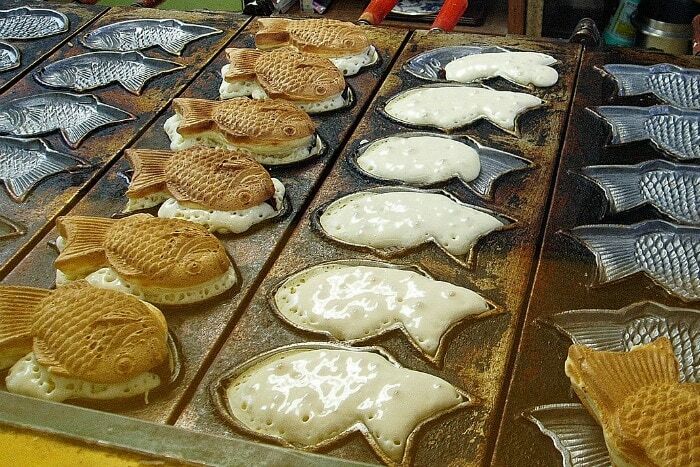 Will definitely have to try making my own custard-filled taiyaki. I have been following Just One Cookbook on Pinterest! I love the red bean paste taiyaki although the custard ones and chestnut ones are also delish! Definitely red bean paste, no other filling would make me eat with Taiyaki. I have been eating Taiyaki with the red bean filling since I was a little kid. Like “Just One Cookbook on Facebook”. Thanks for posting so many delicious and workable recipes. I would use red bean paste for the filling because red beans is my favorite.I am not too crazy on custard and my next filling is nutella. Also, I might use yellow bean paste too. Red bean paste! It’s a classic, or I’d love to try black sesame paste! I think that would be yummy too. Love your recipes. Following you on Facebook. “Like” Just One Cookbook on Facebook. Following you on Youtube. Love the videos. I love red bean paste the most, but taiyaki with chocolate or cheese are also delicious. RED BEAN….is there any other???? Share Taiyaki post on my timeline. I would put Nutella in my Taiyaki! It sounds yummy! I would probably use red bean paste or chocolate! i love to kaya (coconut jam)! Cream cheese or coconut jam! I’d put in red bean paste! I’ve shared it on fb! I have never eaten taiyaki before, so the first flavor I would like to try is red bean paste. Although Nutella filling also sounds delicious! Love these! Red bean is the best filling, but I think almond paste would be good too because they put that in Korean Hodo Kwaja (walnut cake) which is similar batter. Apple cinnamon for sure! Maybe also some sort of coconut filling??!! I would put peanut butter in! And subscribed to your Youtube too! We LOVE taiyaki and crave it all the time!! Our favorite filling is custard. But anko is great too! Red bean paste of course! I actually want to put a nato filling, I’m not crazy about overwhelmingly sweet deserts, one of the reasons I like Japanese deserts. I am a fan of taiyaki, but not so much of redbean paste. I enjoy tayaki with custard, and have had it with chocolate chips inside as well. I think it would be neat to try with sweetened chunky cashew butter or kurogoma paste. I have liked JOC on Facebook. I follow you on Pintrest too! Red bean paste, fruits, custard and Nutella! I would like mine filled with custard. I subscribed to JOC on YouTube. Very nice videos, BTW. I love taiyaki with anko but would love to try with custard. I like the red bean filling, but I really like custard!! Just liked you on facebook. Subscribed to your youtube channel. I like red bean paste filling! I am following Just One Cookbook on Pinterest. I would try many different fillings! Definitely nutella! 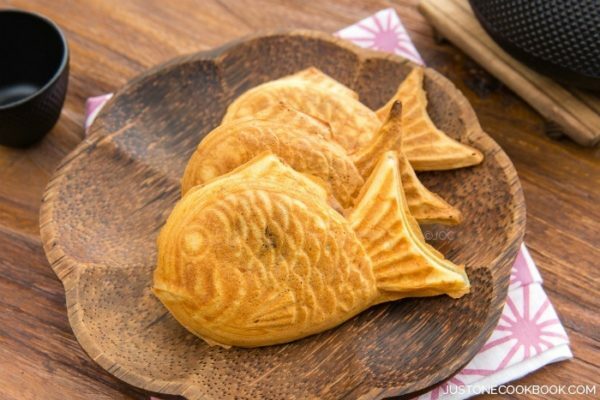 I would love to try and make taiyaki at home! And fill it with lots and lots of CUSTARD! Yum! I’ve had taiyaki at the DC Cherry Blossom Festival, but never seen a recipe for it before. Thanks. 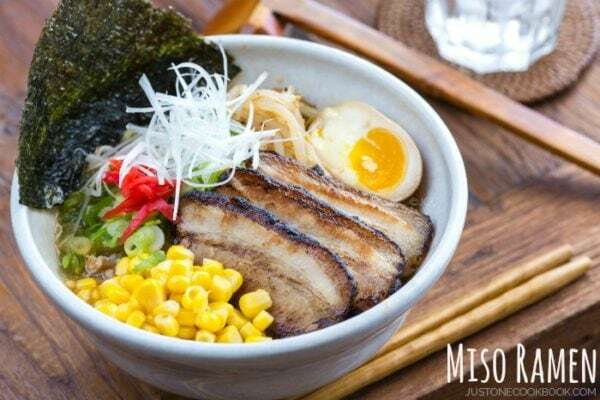 Just shared your Miso Ramen recipe on Facebook! Liked Just One Cookbook on Facebook! I am following you on Google+! Subscribed to Namiko Chen on YouTube. I subscribed to Namiko Chen on YouTube. I love love red bean paste as my filling, but custard sounds absolutely delicious! Anko! My hubby loves Taiyaki! A flavor I saw in Asakusa one time and regrettably did not get. I like Just One Cookbook on Facebook! Shared it on my facebook page. What a unique treat…custard or red bean sounds yummy! I’ve tried red bean fillíng, i prefer custard filling, i would try to make this soon. Tks for this delicious receipe. I would lovee to put green tea custard inside!!!! I would love to try red bean paste! I would put custard filling inside the taiyaki. I want to make Taiyaki at home please! I follow on Pinterest — and I *love* red beans! My filling would be the red bean. I also like the idea of putting jelly or fig in the middle. I follow Just One Cookbook on Google+! I would put sweet black bean paste in it! I couldn’t find any adzuki beans near my area so I tried a bean paste recipe using black beans. It was really good! I even used little balls as filling for onigiri! I am subscribed to Just One Cookbook on youtube! I would definitely stay with the traditional anko, it is so good I can’t imagine using anything else! Thanks for all your wonderful posts!!! I already follow on Facebook! I love getting all the recipes! As a filling,red been paste is amazing! Since you said the texture is between waffles and pancakes..I think a berry preserve filling would be nice! (I love to eat fruits with my pancakes!) Nutella sounds good, and so does honey! I am subscribed to the you tube channel. Hyperlink comment 🙂 it looks hectic! Cheese! I have fond memories of getting imagawayaki in Tokyo filled with warm melted cheese. It was so delicious! Sorry I can’t quite remember what kind of cheese it was, but be creative! Already ‘Like’ JOC on Facebook. I'm already subscribed on YouTube. And I am now following you on Pinterest! I would make a sweetened kabocha filling with a little milk, cinnamon,maple syrup and a touch of salt. I love red bean taiyaki! Cream cheese is the best in Taiyaki! I follow you on G+. By the way – I would love to win this. I lived in Japan for a year, and worked in a building that was on top of a taiyaki maker. Although they called them amataro (???) – and they had either red or white bean filling. So excited to see your recipe!! In my taiyaki, I would put the red bean paste – since i missed out on trying it when I was in Japan. I think it’s hard to find a better filling than red bean paste but I’d go with cherry filling for something non-traditional. Oops! Forgot to answer the question… *smacks forehead* I am a sucker for red bean paste, so I really don’t know if I’ll ever branch out. But if I was really going experimental I might try avacado filling. I’m subscribed to you on Youtube! Oooh, love your Pinterest! I followed you! Just finish followed Just One Cookbook on Google+ . I like the traditionally 1 which is the red bean paste but if i could make this will try this with kaya. I think it will be taste great. I would Taiyaki with maple custard and bacon bits. Nutella or red bean would be my choice. How about strawberry!! Or pb&j!! Possibilities are endless! I love taiyaki filled with red bean paste! Crunchy cookie butter would definitely be my go to. I’d put in red bean paste and vanilla ice cream — classic! I’d also experiment with dulce de leche, chocolate ganache, and raspberry jam (going with the macaron fillings here…). I’d try the red bean paste. But then I’d like to try a savoury version of taiyaki, why not? Something fishy and delicious in a yummy fish-shaped pancake! I would like to put cheese inside Taiyaki. My husband says marshmallows, caramel, and pecans!! We want to have a Taiyaki party. I’m following you on facebook! I’d like to have a salt inside including shrimps and corn. I subscribe to JOC on YouTube! I follow JOC on Google+! I would like a sweet and salty filling such as nuts and dried fruits. A savory filling like caramelized onions would also be delicious! My favorite is red bean paste but I’d like to try one with chestnut paste. Following Just One Cookbook on Google+. I would love to win one of these taiyaki pan giveaways. My favorite filling would be Nutella. I already follow you on Facebook. Thanks for sharing the recipe. Sure hope I win! Like your Facebook Fanpage Nami..
I’d like to put ice-cream inside taiyaki! I already subscribed to you on YouTube ! I already follow you on Pinterest! Red bean! It’s been several years since I’ve had taiyaki and I want the original! I’ve tasted taiyaki filled with green tea paste and it was heavenly. Definitely something I’d want to make myself. Nutella sounds like a fun and delicious version! I subscribe to your youtube channel, Nami. I would like to put in Cream Cheese! I would LOVE to try putting black sesame ice cream inside my taiyaki! I know it might melt a little, but can you imagine it? So creamy and the contrast of the hot outer and cold filling would be amazing! Have also started following Just One Cookbook on Pinterest! Peanut butter would be yummy! I think Red Bean paste would be more up my alley. That cones from a chocoholic, mind you. 🙂 Somehow red beans feel right. I follow your Youtube page. I’m a follower of your beautiful Pintrest page. I would love to try apricot or apple pie filling! But not until I’d tried red bean paste taiyaki! Red bean paste is a classic, but cheese (usually La Vache Qui Rit) is my favourite! Kaya – the most well-known jam in Southeast Asia. I would put banana and walnuts in my taiyaki! I would love to fill my taiyaki with matcha curd or matcha creamcheese. Following you on all channels. Have a wonderful day. I’ve liked Just One Cookbook on Facebook! I Subscribed to Namiko Chen on YouTube! I shared one post of Just One Cookbook on Pintereston my timeline! I had my first taiyaki just f ew weeks ago and would love to wIn this! I like Just One Cookbook on Facebook. I’d definitely go for the standard red bean paste filling! Liked Just One Cookbook on Facebook. I have subscribed to Namiko Chen on youtube. Wow，I really love it with custard! Liked on Facebook and Youtube. Bonus Entry 1: “Like” Just One Cookbook on Facebook. My family loves taiyaki. It would be so great to be able to make one at home and enjoy them. Following Nami’s recipes are just wonderful and opened my cooking fun-ness! Bonus Entry 2: Subscribe to Namiko Chen on YouTube. I’ve shared a post on facebook. 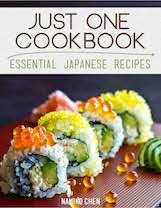 Bonus Entry 3: Follow Just One Cookbook on Google+. Bonus Entry 4: Follow Just One Cookbook on Pinterest. I follow Just One Cookbook on facebook, youtube and google. Would it still help to do that for the bonus drawing? I would put either green tea custard cream or anko in 🙂 should be amazing. I like traditional red bean filling, but chocolate and banana is good too! Crushed roasted skinned peanuts with brown sugar and cinnamon powder! Of course: Red bean paste!!! Hi Nami! My son, Maximilian, and I have to go all the way to San Francisco to get Taiyaki, which isn’t often due to the distance (1500 miles from Papillion, Nebraska) ! We adore it. Max loves a chocolate filling, I love the Red Bean paste. I think I would also like to experiment by putting a sweet potato filling, a cinnamon sugar crumble, or some apple/strawberry filling (like an apple/strawberry pie filling) for a light breakfast Taiyaki. A S’mores one would be awesome also – marshmallow and chocolate with crushed graham crackers. As a side note: For his graduation from high school, I brought Max on a trip to SF and let him bring a friend. Max introduced his friend, Darwin, to Taiyaki at the mall in Japantown (we stayed in Japantown)… his friend was thrilled! Making this at home would definitely have Max coming home more weekends from university! Thank you for the recipe! I hope that I can make these in a pancake form since I don’t have a Taiyaki maker. Have a great day! Liked on Facebook… and invited about 11 people! I would say keep it traditional but its never bad to be adventurous with nutella! Shared on my Timeline on Facebook. Shared on a friend’s Timeline on Facebook. I would like the red bean paste for the filling. My siblings aren’t fond of beans so I would probably have to use nutella for some of them. I still like the classics with red bean paste, it’s the best. I would put chocolate custard or a cherry filling. I like red or green bean paste . Thanks for your sharing . I’d love to figure out a way to put ice cream inside. I know it sounds crazy, but maybe if the ice cream was super chilled (dry ice? ), it would hold up long enough. I’ll try with the classic red bean paste first! It’s always my favourite <3 then probably would try on putting matcha and maybe apples too? I have “LIKE” Just One Cookbook on Facebook. Red bean paste or lotus paste–those are my favorites! I have followed Just One Cookbook on Pinterest! I would fill with red bean paste. I first had these in Korea. I was living alone in a foreign country for the first time and my landlord gave me one on a day that I was feeling particularly homesick. He handed it to me with a twinkle in his eye, telling me that it was a “bean paste” fish, and that I would like it. I was then told to go take a walk, and to this day taiyaki bean fish bring back memories of a walk through the city on a cool fall day, kindness, and the assurance that all will be well. love the red bean paste, custard, would like to try different kinds of fruits like strawberries or blueberries should be ok I think..tokiyaki is like pancakes or crepe just have a filling inside love them when they are hot just came from the iron pans. I am an avid fan of JOC hi Nami how’s your family….. I believe dark chocolate and strawberry, maybe banana too. subscribed to channel on YouTube! Thank you for this opportunity to win this cool gadget! I’d be the coolest Grandma with this baby! I think something fruity, maybe strawberries or blueberries, would be outstanding! I love taiyaki and traditional azuki red bean paste taste the best! I shared a photo of the Taiyaki from your Facebook page. Fingers crossed! Love the good old red bean paste fillings, but i would want to try Nutella or peanut butter for a change! I would definitely fill with the sweet bean filling. We love that in our house. Taiyaki tastes best with anko. I like taiyaki with typical red bean paste but I’d like to try with green bean as well. 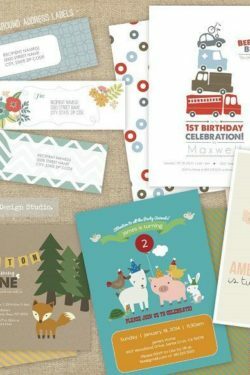 Been following your Pinterest, my favorite pins! Custard and Nutella are my favorite fillings but red bean paste has been entering my diet more and more lately. Been following your Pinterest, my favorite pins!! Would love to put Red Bean paste in- yum! I would put in red bean! I would be curious to try nutella! I would put a vanilla infused custard inside! LIKE Just One Cookbook Fb page 😀 DOne! I follow on google plus. If there are two things I really like eating, it’s pumpkin/squash and chestnut. So next time I’m making Taiyaki, I’ll put pumpkin puree and chestnut puree inside. While I like it when there’s smooth koshi-an in taiyaki, my absolute favorite filling would have to be custard! Thank you for offering this giveaway! I have liked you on Google+! I am also following your Pinterest board! I follow JOC on Facebook. I follow JOC on Pinterest. I follow JOC on YouTube. I follow JOC on Google+. I have only tried it with red bean paste, would love to try custard next. I would use Nutella, it’s so nice! Of course red bean paste. My favorite will be red bean filling. But I would love to try with durian filling as well. i would fill it with vanilla or green tea custard cream. I’d probably use red bean paste and nutella! Red bean paste sounds the yummiest, but I love custard too. 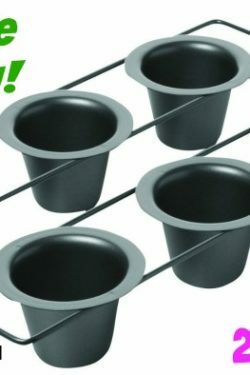 Grew up with Japanese food but never saw these; I guess Mom didn’t have a pan for it. I shared this photo on my wall. Red bean is still my favorite, but I’d love to try making yuzu lemon curd taiyaki! and I should have been following you on FB a long time ago! problem corrected. I would love to try the traditional red bean paste. Tsubushi an in my taiyaki, please! I would make red bean paste taiyaki! They are definitely my favorite. I’d like to try something with matcha too ,though! I love this snack, it’s so versatile, it’s go well with any filling . My favorite is still the red bean paste filling. I will love to try another kind of filling. I would love raspberry jam filled taiyaki! I would fill them with red bean paste for a special taste or just with nutella for my sweet tooth!!! We had a taiyaki shop near us when we lived in Japan and our families favorite fillings were cream and an apple pie. cream and red bean filling! Apart from anko? Hmmm…. maybe custard cream, to make it like Imagawa yaki? I would love to fill my Taiyaki with matcha cream with azuki because these two are my favourite and I just can’t choose one over the other! I would use red bean paste filling. I like JOC on Facebook. I Followed Just One Cookbook on Google+. I love red bean paste too, but the Nutella, with some sliced banana would also be very welcome in my house. Like you on Facebook, and following on Instagram too. I have you on facebook. 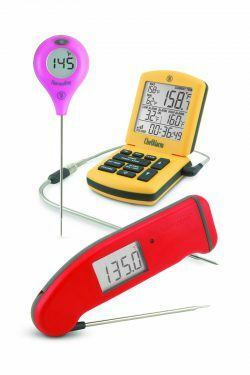 I would LOVE to win this and learn/ create new recipes ! I would put Banana pudding ! I have “liked” JOCB on facebook! Subscribe to Namiko Chen on YouTube. And it’s still red bean paste! Liked on facebook – the nutella one looks really good! I would put red bean paste in my taiyaki. I already liked JOC on Facebook. I have been subscribed on YouTube. i would like to make an egg custard or like the filipinos call it leche flan. lt is sweet and really yummy. l’ve been cooking your japanese recipes and they are really excellent. tha’s why l follow you on email. Thanks for the good and wonderful recipes, l love to learn how to make ramen noodles and the different soup that you make with it. Thank you for sharing the recipe and in advance for the Taiyaki mold. I love Japanese food, and you show it very easy. I would love to try taiyaki with red bean paste or nutella! Anko filling is the best! Red bean paste with mochi pieces! You can’t go wrong with red bean paste but I would love to see a thick coconut cream custard filling with fresh coconut meat. I would like to put a sweet egg yolk custard inside. Share on my Facebook timeline. Our favorite and we made it many times this summer! Yummy! Well, I already subscribe to everything but the pinterest, so I’ll just leave a comment here. I wouldn’t mind trying taiyaki. My husband loves anything with red bean paste in it! Red bean paste for me! Stuff with adzuki beans or kombocha custard! I want the Taiyaki Maker please ..
Red bean would be my top choice!! I think a honey-avocado paste would be good as well. =) Thanks for sharing this giveaway with us! I’m already following JOC on Facebook! I live in Thailand that has a lot of fruity paste to try with taiyaki. The most I want to assort is pineapple paste (we grease fresh pineapple and stir on fire with sugar and a little bit salt until its becomes sticky and yellow gold colour) .Then I will try with mushy young & fresh coconut paste ( this will be soft ,white and smell like coconut juice). I believe your Taiyaki will be very delicious with these kinds of my Thai paste. In fact, we have many kinds of sweetened fruits to try and I hope I mould have a chance to get one of your Taiyaki maker. Thank you. PS: I enjoy your recipes very much especially the ones easily cook with small oven. Thank you again for your intention to give me and all your fans the best. Dhamma bless you and your family. I would like to try a cream cheese mixture. Frozen red bean ice cream. I like chocolate ice cream in my Taiyaki. My favorite filling is custard. But I also like tsubu-an too. I would use Nutella, or red bean paste! But most of all, I just want to find anko!! Plus I Liked Just One Cookbook on Facebook. And I’ve subscribed to Namiko Chen on YouTube. And I followed Just One Cookbook on Google+. And I followed Just One Cookbook on Pinterest. I guess I’ve gone Nami-crazy! I just like the red bean filling! There are so many other fillings in Taiwan. I would like to try it with taro paste filling too! I would love to play around and see if I can make ice cream filling! I had one ice cream version of these fishies and loved it. I love the custard cream filled taiyaki. Nutella sounds yummy though!! My all time favourite Taiyaki filling is custard, but I’d also put red bean paste. I “Like” Just One Cookbook on Facebook. I’m following Just One Cookbook on Google+. I’m following Just One Cookbook on Pinterest too! I’ve “Like” Just One Cookbook on Facebook. Following Just One Cookbook on Pinterest. Fillings would probably include coconut flakes mixed with mung beans, strawberry jam, Nutella, chocolate chips, peanut butter, cream cheese, and maple syrup. I would put my moms famous lychee paste inside, so yummy! I also liked you on Face book! A very tasty idea. I’m too traditional, nothing can beat red bean to me. I would love Nutella or red bean. Custard sounds delicious too! What about pie filling? Or cheesecake filling? Like you, I would love red bean paste in taiyaki. Nutella also sounds like a great suggestion. Yum, my mother used to make these when were in a rush out the door- scrambled eggs and chopped bacon makes a handy ‘running out the door’ breakfast. I’d use red bean paste for filling. I like Just One Cookbook on Facebook. I think I would try the banana caramel spread I have, or blackberry jam. I’ve subscribed to Namiko Chen on YouTube. If you love squid or octopus, try this recipe with my favorite Miso Vinaigrette (イカ、タコの酢味噌和え). It’s very simple and easy to make. A great appetizer to enjoy with sake! I’ve always been following you because i find your recipe simple and easy to follow because I would love to learn more and more Japanese cooking! I’m gonna try my luck for this one. I hope I’m lucky enough to win it! What kind of filling I would put in my Taiyaki? Definitely Anko! Why? Because I like the original version. But putting jam inside would be nice too! I’ve always wanted to eat this every time I saw it in Japanese drama but never had the chance to eat it. Bonus Entry 1: I’ve already LIKED your FB page for a while now! When I was in Japan as well I loved fresh, hot Taiyaki! Amazingly I found it in the depths of Omoromachi in Okinawa! It took a few hours to scout out the only shop there that sold it, but it was just completely amazing! Mung bean paste with condense milk. I’ve never made red bean paste but I really want to try it. And my grandkids would love the fish shape. classic red bean is the best! I’m following already on Pinterest! A bit of red bean on the upper half, and custard on the lower half. I think this autumn weather lends itself to a sweet potato pie or pumpkin pie kind of filling. I love red bean paste and it’s my favorite taiyaki filling! I love red bean fillings!! Konbanha Nami san , kyo mo commento wo kakitai desu:) taiyaki ha tsukutta koto ga nai kedo, tsukutte mitai desu. Ichigo to banana tameshitai desu. I follow your YouTube channel! I follow you on G+! I’d like pumpkin creme filling for fall! I would put the original filling, anko paste. Already liked Just One Cookbook on Facebook. Already followed Just One Cookbook on Google+. I’ll fill with some strawberry jam!! Nhammy!! This is toooo awesome! Oh gosh, the filling is a harrrrd decision…but I guess I’d want to try some kind of custard/bean paste/mochi filling, hah! Or some type of green tea filling would be amazing. I follow you on Google+!! And I also already follow you on Youtube, from fitforthesoul. 🙂 Thank you so much, and now I’m so hungry for these. Red bean paste. Traditional always best!! Ahh, I would put my mother’s favorite lotus seed paste in it! (I like lotus seed in pao the most.) But for my American friends, I would probably put Nutella and peanut butter inside! I like taiyaki with anko, but I think that taiyaki with Hershey chocolate in it would be good too. I would love to try Sweet Potatoes and sweetened condensed milk inside it!!!! or spiced apples!! I loooove red bean paste so red bean paste would be best! I LOVE anko in my taiyaki!!! I’ve just liked Just One Cookbook. I just followed Just One Cookbook on YT. I just followed on Google+. Nutella. That way I know if I make a large amount my family and friends will eat them with me. Followed on Just One Cookbook on Pinterest. Anything sweet really…. from the traditional red bean paste to chocolate / nutella to something more Asian like sweet yam paste or mung bean paste or kaya / coconut jam!!! Go for savoury with tuna or chicken too! My favourite has to be koshian but chestnut seems like it would be great as well! First I’d make it with the traditional red bean paste, as I’ve never had one and would like to try the original. Then I would start experimenting with lots of other things, including adding protein powder to the dough to increase the nutritional value. I have followed you on Pinterest! I subscibed to your YouTube channel! I would like to put anko into my taiyaki, as well as i’d like to try nutella, lemon curd or vanilla custard. Apples, cinnamon, and brown sugar. The filling would be red bean paste or nutella for me. I have always wanted to try red bean paste with Nutella. But I also think these would be super yummy with a sweet fruit filling! Yummy! Liked on Facebook! And in my home! Red bean paste would be my first choice, but I know Nutella would be a favorite as well! Done! Bonus Entry 5: Go to my Facebook Page and “Share” one of my posts on your timeline. I would fill my taiyaki with cookie butter! I’d fill it with apple jelly o sweet orange jelly. I liked Just One Cookbook on Facebook and would love to try a nutella filled taiyaki! I would like to attempt one with Boston cream or some variation of that kind of filling. I like red bean paste in my taiyaki. Already like JOC on Facebook. Custard & Cream Cheese. Yum Yum. I have subcribed to Namiko Chen on Youtube. Oh dear.. I would put lactose/dairy free chocolate, peanutbutter, maybe some sort of cooked meat, marshmallow fluff, jams… I would turn it into a pb&j or a fluffernutter! I always love the classic red bean paste flavor. followed you on google+ !!!! Love this with red bean paste and introduced this to my boys. They love it too! Already following on Pinterest. Green tea custard. 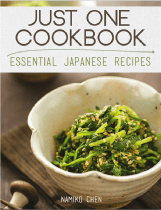 Follow Just One Cookbook on Google+. I´m a big fan of your site and your recipes! And now this awesome recipe that i just know out of japan pics 😀 Totally awesome! I would try the Taiyaki recipe filled with black sesame paste or jam or maybe i would also try a combination of jam and sesame paste. And i liked you on facebook. I’d like to put classic red bean inside. I would put homemade red bean paste inside! I would absolutely love one of these! I’ve eaten these with red bean but I think custard would be really good. Or maybe cream cheese with jam?? I would make these with red bean paste and Nutella!!! I would probably put red beans paste in them since it is a classic. I have like you on facebook. I am wondering if it would make any sense to put a fruit in there like a blueberry; then of course I was thinking chocolate! I “Like” Just One Cookbook on Facebook where I am Margot Core. I follow Just One Cookbook on Pinterest where I am Margot Core. I would stick to putting red bean paste in the taiyaki. Bonus Entry 3 done! Subscribed to Youtube. Bonus entry 4 done on Pininterest! By name of Elaine Woo. Already liked on Facebook. Green tea custard. Already follow on YouTube. Green tea custard. Hi Nami. I never noticed your Pinterest, now I’m a follower also! My preferred taiyaki would have either smooth red bean or nutella, but peanut butter is the only thing we have in the house regularly. Already follow on google+. Green tea custard. Already follow on Pinterest. Green tea custard. I think I would do a classic teriyaki with red bean paste. I love red bean paste in taiyaki! I would put red bean paste. I love red bean paste. I would fill mine with black sesame or chestnut paste!! They are my absolute faaaaaaavourite! My house is divided. Half of us want red bean paste and half want nutella. I like putting red bean paste in these. I would most defintely go with red bean paste as my filling. Red bean paste all the way! Red bean. I love red bean filling. (entry #1) I would fill them with red beans first and then Nutella, because, helloooo, Nutella! But I am most intrigued by custard. I do love custard-filled hand-held desserts so I would have to try that as well. Yes. ALL the fillings! I hope I did this right I’m not quite sure how to get the link to show without it going back to my feed page. Lastly I would fill it with Apples and Vermont sharp cheese. A Vermont staple. Already sounds so yummy. Shared your Kabocha squash soup recipe on Facebook. Red bean paste for sure!! Red bean would be the best!! I love Nutella and banana! I would use red bean paste but nutella sounds so good! A local shop in my town makes taiyaki filled with Okinawan sweet potato and matcha azuki bean paste. Both of them are delicious! I’ve subscribed to your Youtube channel. I love how easy your videos are to follow, and your videography is stunning! I will put Adzuki beans inside taiyaki. Red bean paste in our taiyaki! Yum!! Fresh strawberries and sweetened cream cheese/ whipped cream mixture, then sprinkle powdered sugar on top. Grandsons would love them. Liked One Cookbook on Facebook. Posted Kabocha Soup on my Facebook Timeline. YUMM. love red bean paste, custard, nutella and fruits like strawberries or blueberries…not sure if I posted already before but here it goes again lol….I am always an avid fan of JOC and have tried some of the recipes with my family as the tasters…how you doing Nami…. I would love to put red bean paste inside. mmmmm! I would love to put fruit custard inside. mmmmm! I would fill my Taiyaki with nutella or cookie butter! I will fill the taiyaki with anko, or the south American dulce de leche or mate jam. the last one is very similar to the matcha in color and it is a bitter tea. I like to put red bean paste or custard in taiyaki. Hmm.. I never had taiyaki but red bean paste sounds good. I follow Namiko Chen on You Tube…..Great Ideas!! and I like red beans…but my kids like peanut butter. I Shared one of your posts on my timeline. Why are people posting red bean paste. Red bean paste, you can’t go wrong! GREEN TEA ICE CREAMMM… imagining the hot and cold.. Sweet and savory taste in it.. Yyyuumm!!!! Red bean paste is my favorite, but custard is amazing too! Red bean paste would be great why not make them as mini-chicken pot pies? Red bean paste, for starters! I Love these recipies. I have tried so many which has come out nicely. We in SriLanka a little bit difficult to get Japanses food items and its very expensive. But I mange to get most from my Sister who lives in Japan. Red bean paste, of course! My favorite filing is green tea custard with red beans! Love the Azuki bean paste and my husband and kids like the custard. Thank you for sharing your recipes! I just liked your Facebook! I just subscribed to your YouTube channel. I just followed Just One Cookbook on Pinterest! 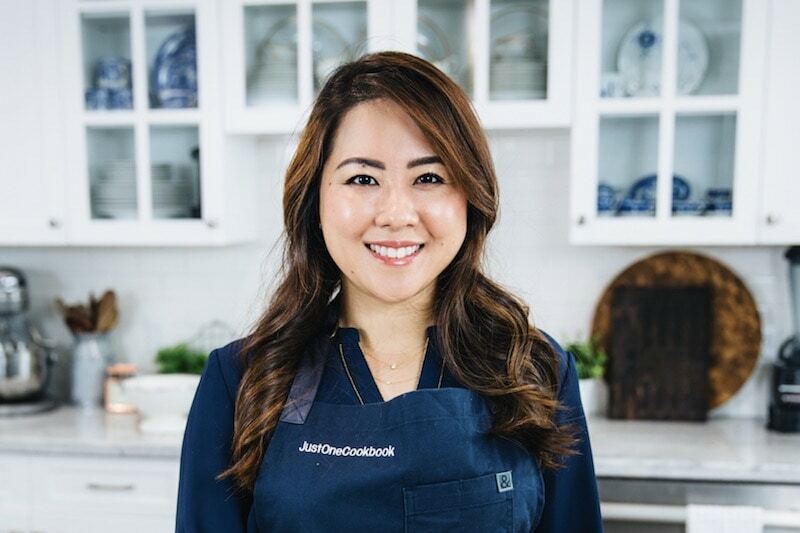 I just followed Just One Cookbook on Google+! The Taiyaki Maker would be best for making hot cake made with chunks of baby coconut meat and fruit cocktail and milk just like the “Crema De Fruta” i usually make during Christmas. It is actually a chilled dessert that has a combination of shaved baby coconut meat, fruits cocktail, whipped cream and condensed milk. I imagine it to be really mouth watering. I am pretty sure that you will also love it especially if you have sweet tooth just like me. oh wow I love taiyaki and i’m hoping to eat them in japan soon! I would stick to the traditional of putting red bean paste inside, or black sesame and peanut mix, like mochi. So cool Nutella could be good. I always try to get with custard. Its my favorite. Since I have never tried Taiyaki before I would love to try out many different fillings. I have always wanted to try it, especially with red bean paste. The custard one sounds really good too. I would put Ham and Japanese mayonnaise! And custard is my favorite! Korokke, one of my personal favorite. I always made this! I would put a cream cheese/whipped cream combination filling OR vanilla pudding filling (the same kind that is used in “long john” donuts which are found on the Big Island of Hawaii! Red bean paste is classic but I bet green tea flavored cream cheese would also be yummy! I’ve made several of your dishes Nami. 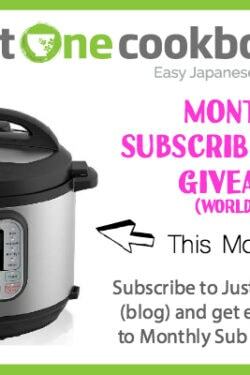 My husband is Japanese so he likes to go to Cookpad for recipes but I like to go to your website since all the recipes are in English and the pictures and instructions are so helpful. Thank you for posting tons of Japanese style recipes! Do you have any nitsuke receipes? My Japanese grandma would make this for me when I come home to visit since its my all time favorite! Followed Just One Cookbook on Google+. Followed Just One Cookbook on Pinterest. went to yourFacebook Page and shared one of your posts on my timeline. I would put anko red bean paste inside my taiyaki! I love it! I follow Just One Cook Book on Pintrest. I’ve always wanted to try Takoyaki, and I’d love to make my own even more. I’d try red bean paste first, but then I’d experiment with custard and marmalade. Hmmm…for the filling, I think a bannoffee would probably be amazing!!! Shared a post on my timeline! love red bean paste but wanna try with another flavors eg. Choc, strawberry. likes your page on Facebook! A classic red bean paste filling is the best! I like Just One Cookbook on fb. I am following Just One Cookbook on Google+. I would like to try a guava and cream cheese filling. I love Aduki bean paste! It tastes sooooo good!! Besides the classic red beans paste of course, I want to try fillings like strawberry cheesecake or blackberry pie filling! I like red bean paste but for my kids, I’ll try peanut butter and banana! They will surely love it! Red bean paste, the classic! Maybe custard too. I would likely fill it with a egg based custard. Or vanilla. Or lemon. Or….. Watching all of the videos on youtube. I like Taiyaki with red bean paste filling. always red bean – yum! Red bean paste for sure! I have already liked your Facebook page! I would love to try custard and cookie butter! Matcha custard! Two of my favourite fillings together! 😀 but I do love a classic red bean filled one too 🙂 I miss having taiyaki! I would fill it with bacon and maple syrup, best of both worlds. I definitely LOVE read bean paste in Taiyaki. Last summer, I tried a custard in Taiyaki in Japan, but was not too impressed by it. Had chocolate chip Taiyaki a couple of years ago in LA, and loved it, so Nutella may work, too. definitely red bean! perhaps nutella if I happen to have some. Liked on facebook and subscribed on youtube! When I go to Tokyo, the bus I use stops at a rest stop that serves “Okonomitaiyaki”- taiyaki filled with okonomiyaki toppings like noodles and cabbage! I’d love to make that myself! I would like it with red bean paste and also with creamy cheese! I am already a follower on facebook! anko, of cooourse ! Thanks for that giveaway ! I like the traditional red bean paste! I already “like” you on Facebook! I already subscribe to you on YouTube. I follow your page on Facebook ! I have tried the red bean paste and custard in the taiyaki and they’re yummy! I think I’d like to try a Nutella or peanut butter taiyaki next! I’ve liked your Facebook page. i would make sweet egg inside this pan! My little ones would love it. I have been following on all Facebook/Youtube/Google+ and Pinterest . I’ve liked you on facebook! I follow you on Google+! I like taiyaki filled with traditional red bean paste, but I wonder if something like sweet almond paste or lemon curd would be good too? I followed Just One Cookbook on Pinterest! I LOVE these! I was just in Seattle where a company was making these at the farmers market. I really love chocolate with marshmallows or for savory cheese, onions, and bacon! Love Taiyaki, never thought to make it at home. Sure hope to win one of the Taiyaki maker. Red bean paste for me, I also did facebook like/share, g+, and youtube. I love sweet red bean paste the best, but would like to try sweet chestnut and lima bean paste? Like kuri kinton. I would put a custard filling. I enjoy your recipes. Easy to follow. Keep up the good work. Shared your post on my timeline. I once ate a taiyaki with green tea filling and I absolutely love it! I liked Just One Cookbook on Facebook. I subscribed Just One Cookbook on Youtube. I Followed Just One Cookbook on Facebook. I Followed Just One Cookbook on Youtube. I Followed Just One Cookbook on Pinterest. I would like to try with Read Bean Paste and Nutella. I like it the traditional way: with red bean paste, but not too sweet. The Nutella filling is good too. I would love green tea filling!!! I think anko is the best filling forever but i also think putting some savory filling like fried bacon with some bbq sauce might be interesting . I am subscribed to your YouTube channel, of course, and also follow you on Google+. My nickname on both social media networks is Sawa. Im from Mexico so I would use guava paste. I would want to fill a taiyaki with custard! Hard to imagine anything better than red bean paste, but I can imagine a mixture of cream cheese sweetened with either lemon curd, membrillo (quince paste) or gulkand (an amazing Indian rose petal jam). Or just plain good chocolate. Would love to try it with nutella, or a flavored custard. My filling would be okonomiyaki savory style with red paste and some fish of your choice. Adzuki with cinnamon and matcha powder! Shared your post on my time line. Since I was not so lucky to get a taiyaki maker and I might be going to Kyoto or maybe Osaka. Will I be able to find it there? It doesn’t have to be Tai, could be other molds.